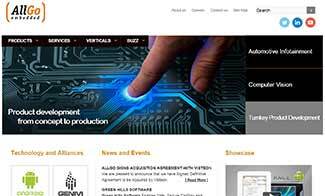 NYSE-listed automotive cockpit electronics supplier Visteon Corporation has acquired Bangalore-based AllGo Embedded Systems Pvt Ltd, a product design company focused on providing multimedia solutions for automotive and computer vision markets. The financials of the deal are not disclosed and the deal is likely to close during the first quarter of 2016, the company said in a press statement. AllGo is an infotainment media playback supplier offering media and connectivity solutions for the connected display audio market. It licenses multimedia, smartphone connectivity software and multimedia codecs to automotive customers. "AllGo's position in multimedia and smartphone connectivity software adds scale and depth to Visteon's infotainment software capabilities," said Sachin Lawande, Visteon president and CEO. AllGo was founded in 2005 by former Motorola executives K Srinivasan and Nirmal Kumar Sancheti. Srinivasan began his career with a startup in California and then moved to Motorola Global Software Group where his association lasted for nearly a decade. He holds a master's from University of California and bachelor's from IIT Madras. Sancheti earned a PhD in Mathematical Programming from Indian Institute of Science, Bangalore and worked with Motorola, Philips and NXP before launching AllGo. The company employs approximately 140 people across India, the US, Asia and Europe. "With our production-proven middleware and Visteon's expertise in automotive infotainment solutions, the two companies have a strong strategic fit that will enable us to expand our global market share in the connected display radio market," said Srinivasan. US-based Visteon designs, engineers and manufactures cockpit electronics products and connected car solutions for vehicle manufacturers. The company provides instrument clusters, head-up displays, information displays, infotainment, connected audio, and connectivity and telematics via its brands such as Lightscape, OpenAir and SmartCore. Headquartered in Van Buren Township, Michigan, Visteon has nearly 11,000 employees at 50 facilities in 19 countries. It claims to have generated $3.1 billion in electronics sales over the last 12 months. AllGo Embedded Systems Pvt. Ltd.